By far the most popular handheld vacuum for pet hair produced by Hoover is the Platinum LINX Pet BH50030. The name of the model suggests a high quality, premium handheld vacuum, and most users will agree that it lives up to its name. It also happens to be one of the highest rated cordless handheld vacuums for pet hair on Amazon. However, with the different types of attachments included, it’s suitable for any type of surface whether soft or hard. It has been called by users as a “cheaper alternative to the Dyson Animal” and in this review, we’ll find out why. Effective on carpets, upholstery and inside vehicles. Power Does Not Fade: This handheld vacuum uses a Lithium Ion battery that has an increased run time and fade free power meaning that the suction power will remain consistent throughout its use. Battery Can Be Replaced: When the battery comes to the end of its life, it can be removed and replaced, allowing the vacuum to be used again. Many handheld vacuums don’t allow the battery to be removed. Let’s You Know When Battery Is Low: It has a battery capacity indicator in the form of 3 bright blue LED lights which each represents the power percentage remaining. Battery Is Charged Separate From Vacuum: When it’s time to recharge the battery, simply remove it from the vacuum and dock it. This allows you to store the vacuum away while the battery is charging. Easy Maneuverability & Reach Tight Spaces: The included motorized Power Head Brushroll can pivot 25 degrees, allowing you to easily maneuver around when cleaning carpets, and there’s also a built-in crevice tool to clean confined areas. Easily Get Rid Of Pet Hair: Includes a Pet Upholstery tool which features a triple rubber blade which easily grabs pet hairs. Able To Clean Delicate Surfaces: Includes a Deluxe Dusting Brush tool that features two rows of gentle bristles. The people that know best about the product are those who have actually purchased and tested it out over a period of time. We have researched over 70 positive and negative user reviews on Amazon to provide you with a general consensus of their experiences with the Hoover Platinum LINX BH50030. 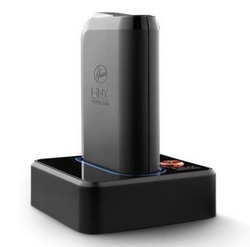 Users have generally praised at how powerful the LINX BH50030 is. It definitely appears to be the most powerful handheld vacuum for pet hair. However, this is mainly due to its Power Head Brushroll attachment (read more about it below), because without it, the vacuum would be an ordinary nice looking handheld vacuum. Independently, this vacuum has more than enough power to pick up a variety of small to medium sized particles and its suction power is still slightly better than most pet hair hand vacs. It’s moderately noisy, but probably quiet enough to use around the home at night without waking up the neighbors. Battery is charged independently from the vacuum. Being an 18V Lithium Ion battery, you can expect to do your entire cleaning without the battery fading in power at any point. Most users get around 10-15 minutes of constant use, which is adequate for a powerful cordless hand vac, but not the best. If you have several pets and need a longer cleaning time, then you have the option to purchase replacement batteries for the LINX models, but at the price of some low-end hand vacs. It can be removed and replaced, which means you can have back up batteries and the lifespan of the vacuum isn’t dependent solely on the battery. The battery only takes a very impressive 3 hours for a full charge, one of the best charging times we’ve seen on a cordless hand vac. The battery is also has an Energy Star certificate which basically means that with the charger, it has been qualified as environmentally friendly units. The Hoover Platinum LINX BH50030 features an ergonomic design and is relatively lightweight, which makes longer cleaning sessions less stressful on the hand and wrist. The bright blue LED gauge is extremely useful and lets you know how much power the battery has remaining. We think that this should be a staple in every cordless vacuum. The opening for the suction is wide but thin, and doesn’t cover much area. However, the main attractions are the removable battery and excellent attachments. The best attachment of all three. It’s directly powered by the battery and super effective. The power head brushroll is the star of the show. Some users have described it to be nearly on par with anything Dyson has to offer. Its main purpose is removing pet hair as well as cleaning dust and debris. Unlike many other main attachments you find with other vacuums, this one is motorized and powered by the battery, not the air suction, which is why it’s so powerful and effective. 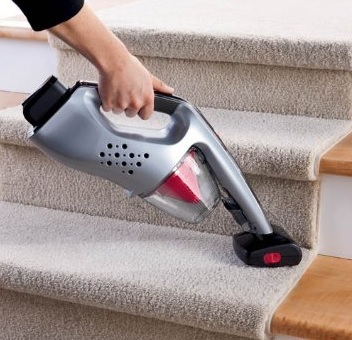 Most users find it very useful on carpets and upholstery, especially when cleaning stairs or inside a vehicle, as the head can pivot 25 degrees to make it easier to access certain areas. Like with the majority of other brushrolls, hairs can get stuck but this isn’t a major problem for this model. At the push of a button, the brushroll can be removed entirely which makes it easy to clean. The effectiveness of the power head brushroll has really left users without a need for the pet upholstery tool, since it does everything they need it to do anyway. The main advantage we see from this tool is that it does grab pet hair (although not as effectively as the power head) and it doesn’t use any additional power since it’s not motorized. This features dual rows of soft and gentle bristles designed for dusting down delicate surfaces. It won’t scratch surfaces and covers a good amount of area. Underneath the tip of the head, is a little flip-up crevice tool that is supposed to lock into place and used for reaching tight areas. Many users have found this to be rather useless, because it doesn’t provide much extra length and is actually quite loose when “locked” into place. Very few people don’t like this and would rather it have the ability to dock the vacuum with the battery as one instead, but most people are happy the way it is, and so are we since saves a lot of space and isn’t a sore sight when in view. The cleaning system of the Hoover Platinum LINX BH50030 is quite sophisticated, as the foam filters capture particles effectively before they get released into the air from the side vents. There has also been a great improvement of the dirt container and prefilter insert, which allows better airflow compared to the previous model. However, the small size of the dirt container means that it will need cleaning quite often, especially if you have more than one pet that sheds hair. Some users with small hands have found it difficult to remove the dirt cup, which requires a tight grip around the base and a twist. Smaller and lighter particles can get trapped within the red cone that leads to the filter, so you cannot see exactly how much dirt has actually been accumulated. This also means that you have to clean the filter often too, so it may be a good idea to get some extra replacement filters. Fortunately, the lifespan of the Platinum LINX BH50030 does not depend on the battery. If the battery dies, it doesn’t render the vacuum useless, because you can always get replacement batteries, albeit at an expensive cost. However, the battery is high quality and should last at least a couple years. The construction of the vacuum itself, with the exception of the mini flip-up crevice tool, appears to be well constructed and should also last a long time. There’s a standard 2 year warranty on both the battery and vacuum, though several users have pointed out that Hoover is quite slow to response to product issues. The question is how much are you willing to pay for the best handheld vacuum for pet hair that’s not named Dyson? Some users feel that the LINX BH50030 is a tad bit expensive especially when you consider the attachments are what make this vacuum so good. But the majority of customers are happy with their purchase even admitting that it can be a bit cheaper, but they acknowledge the fact that it simply blows much of the competition away, including corded models. You can see the live price here.. The Hoover Platinum LINX Pet is a highly rated and bestselling premium handheld vacuum on Amazon. When combined with its effective power head brushroll, it’s a powerful handheld vacuum that will clean your pet’s hairs, but is also suitable for general cleanings tasks. Removable battery allows you replace the battery when it comes to the end of its lifespan, though they are rather expensive. Dust cup and filter will require frequent cleaning. The time it takes for a full charge – super short at only 3 hours. We like the battery guage which shows you the remaining battery life, a feature all cordless hand vacs should have but don’t. We like even more the ability to charge just the battery independently, allowing the vacuum to be stored away. No other cordless hand vac has this feature to our knowledge. The Hoover Platinum LINX Pet BH50030 is perhaps the best handheld vacuum for pet hair that’s not named Dyson, for cleaning pet hair. It has the tools and features to make it versatile enough to be used for general cleaning around the home also. For less than half the price of a Dyson Animal, this handheld vacuum is a great alternative due to its powerful suction and simply brilliant power head brushrool tool, which has convinced many consumers that the Hoover Platinum LINX Pet is the primary choice for cleaning pet hair. 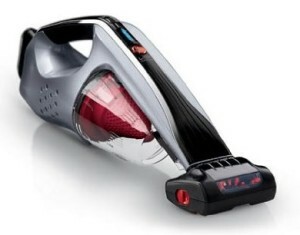 Check The Live Prices For The Hoover Platinum LINX Pet BH50030 Now!